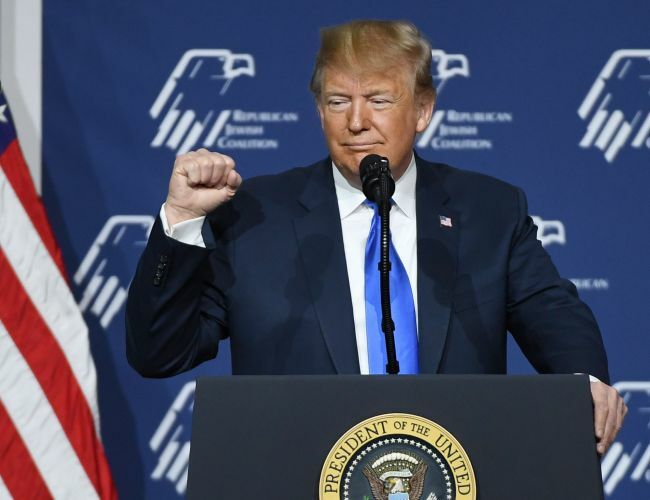 US President Donald Trump made the statement during the Republican Jewish Coalition’s annual meeting. US President Donald Trump said on Saturday (US time) that his relationship with North Korean leader Kim Jong-un remains “very good,” conveying his hopes of drawing Kim back to the negotiation table. His remarks come amid a stalemate between the two countries following the breakdown of the two leaders’ second summit in Hanoi, Vietnam, in late February. The deal breakers concerned denuclearization and economic sanctions. “We’re getting along with North Korea. We’ll see how it works out, but we have a good relationship. Don’t forget, I have a very good relationship with Kim Jong-un,” Trump said during a speech at the Republican Jewish Coalition’s 2019 spring leadership meeting in Las Vegas. In the speech, Trump said the North was “setting rockets and nuclear explosions” when he took office in 2017. “A lot of things were happening,” he said. “We had to walk from one deal,” Trump said, referring to the Feb. 27-28 summit in Hanoi. Pundits say the US president’s remarks are intended to pressure Kim to take the “big deal” that was offered in Hanoi. In a televised interview with “CBS This Morning,” based in the US, Pompeo also said the Trump administration is “convinced” that Pyongyang is “determined as well” to achieve denuclearization. The North’s parliamentary session will coincide with the summit expected to take place in Washington between Trump and South Korean President Moon Jae-in.